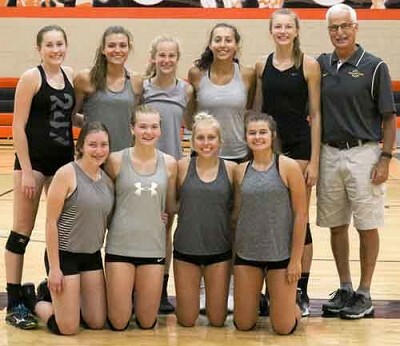 The Stewartville girls volleyball team captured second place out of 36 teams during a team camp tournament at SMSU on July 19. Stewie's only loss was in the championship match to SMSU players and recruits. Team members are, kneeling, from left, Rylee Mensink, Ayla Stecher, Mack Walters, Jaidyn Brower. Standing, from left, Lily Welch, Jolie Stecher, Allie Elliott, Kaitlyn Prondzinski, Erin Lamb, Coach John Dzubay.